We must remember our mistakes lest we be doomed to repeat them. My friend Carol and I drove over on Friday morning, got lunch with new friends we made basically immediately (this is one of the magical things that happen there - I don't know you, but you're a yarn person too, want to have lunch? ), and made it back to the Golden Lamb in time for afternoon classes. 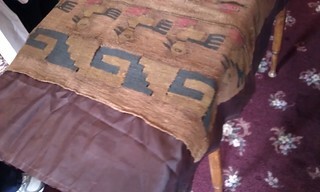 I took a class on Pre-Columbian textiles. Obviously not making them, because I'm firmly a Post-1492 kind of girl, but we looked at fabrics that are so old I kind of can't imagine it. We were a couple in before I remembered my phone. I had talked to Abby (Franquemont, the teacher of all the classes I took this weekend) on ravelry and at other fiber events about the weaving she had done growing up in Peru, and one of the things that had me curious was her talk of the complex symmetries involved in weaving, and how the ways in which the Chinchero did things involved mathematics while not actually having names for numbers. It's kind of mind-boggling still. This piece illustrated all kinds of symmetries, but of course I only got a picture of half of it. I loved the geometric pattern, which was reversed on the other end. There were more ducks or whatever birds on the other end, slightly different from the ones shown in beaks and feet, and facing the other direction. You can almost see the men in the center, flanked above and below by the ducks. There were interesting things done with color here, too, but I can't remember what all. I took notes, and sketched things. It was way cool. The thing most of us related the most to were two boxes full of spinning tools. 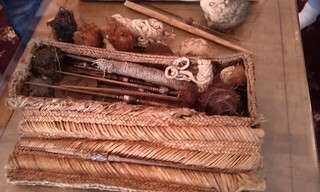 These boxes were buried with their owners, and included several spindles each, plus bits of fiber and a couple of plying balls. The idea of actually burying all evidence of things unfinished resonated with me. This was a nifty piece of resist dyeing that's lasted oh, about forever. The two different parts had been dyed differently - one had red and blue, the other just blue. I also like the Abby reflection in the glass. I loved this geometric piece, and not just because of the great green in it. mystified me, and this is the same kind of mysterious. Awesome, though. Definitely sparked my math-brain. 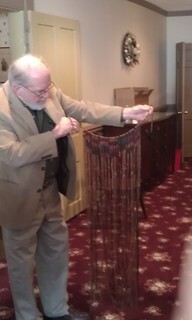 And here's a much larger and more elaborate quipu, held by its owner. Charles Gerhardt owns one of Lebanon's many antique stores (specifically, the one next door to the Stringtopia studio), but his shop is like no antique store I've ever seen. Museum-quality and really old and valuable stuff from all over the world and all of human history. It was full of "oh, wow!" 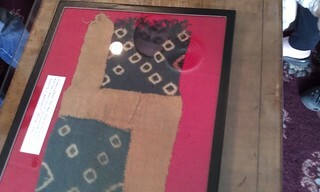 All of the pieces we saw in class were from his collection. After class Carol and I went to check in at our off-site hotel, then made the 2-block walk back to the Lamb for dinner. Their lamb meatloaf was crazy good. Also I love their house salad in an unreal way. I may be trying with limited success to copy it for my lunches this week. The Friday Bash was a good time, as always. 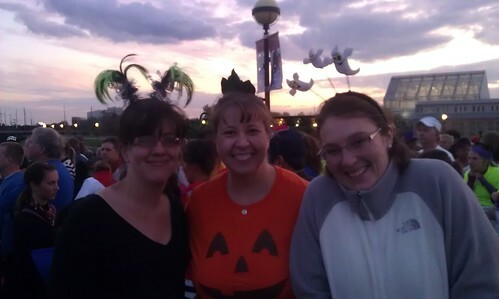 There were spinning contests and door prizes and lots of people and party, oh my! I have no pictures. I barely had a thought in my head by that point. The next morning, went to breakfast bright and early, then to class. 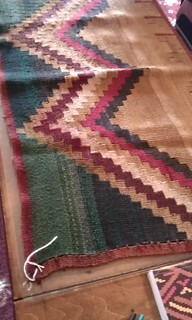 I had a day of Andean Backstrap Weaving. Which was way cool. Those of us who were total n00bs were informed that we were now 5 years old, and so all of the work of warping and setting up the looms had been done for us. 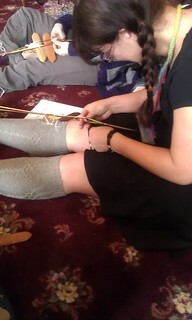 We were shown how to tie ourselves into the looms and tension the warp (with our feet) and actually start to weave. Abby was really good about making us try things, and doing things to make us screw up so we would learn how to fix stuff. This was a more hands-on class than the day before, but I still managed a few photos. 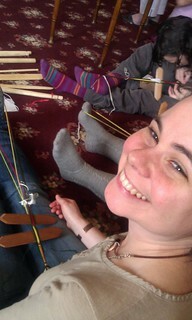 Here's Mandie weaving (She's writing a pattern for those socks - keep an eye out, they're fantastic). And here's Lara weaving. She's been a favorite pal through all the String Things and I was so glad she was in all my classes this year. And here's mine, as I saw it. Backstrap weaving is fascinating in that your body essentially becomes multiple parts of the loom. You control the tension with the way you sit, and so of course that changes as you weave down the warp. The pick-up pattern we did is called tanka ch'oro, it's the most basic thing, but lovely in a symmetric way and really clever in the way it minimizes pick-up work. I learned a lot, and I want to learn more. The 7-year-olds (ie, people who had done some of this before) were assisting, and weaving cool stuff I want to learn too. The classroom was full of people having a really good time learning something hard and totally new, and that gave me such a charge. I loved it. I miss that kind of thing about going to school. And even then, I was often having way more fun than my colleagues (Finite Geometry, I'm looking at you). Another night, another awesome Golden Lamb dinner. Lamb Shepherd's pie was the entree, just delectable. The Saturday evening gathering was also big and crazy. There were competitions for longest long-draw and creative use of a sample we all got in the amazing goody bag. I was so totally worn out by the end of the night, mostly in a really good way. Woke up, breakfasted, and back to the Lamb. Sunday was the only class Carol and I took together, Spindle Techniques for Long Draw and Double Drafting. I think I might need to take this class again sometime when I'm fresh - it was way cool, and there was lots of good information, but I just couldn't process all of it. Here's Abby coaching a couple students in a cross-classroom long draw. I'm not sure a spindle is even involved here. And then Carol and I went around the corner for lunch, did some last shopping, and went home. I was on my sofa by the time the afternoon classes got out. I'm sure I missed some things, but I'm sure Monday was better for me not getting home as late as I have in past years. All the superlatives, man. What a weekend. Huge thanks to Abby and her whole Stringtopian army. I'm already looking forward to next year, but in the meantime, I might have to spend some of my summer at the studio! And I've been watching pi-related videos on youtube. Here are my favorites. Vi Hart has a whole amazing channel of stuff. This one amuses me, because while she makes the pie crust from scratch, she uses canned filling, which is entirely backward from my pie-making usual. I am neutral on the pi/tau debate, but the math here is excellent. This morning Vi posted a video of herself singing pi, but my favorite of that kind of thing is below. I've only seen a few Numberphile videos, but I really dig this one. I'm so amused by the process here. Pi calculated in terms of pie. Also note the video length. This one is just bizarre in a wonderful way. (Warning: there's a little inappropriate language.) I had seen and loved this video a couple years ago, and it turns out it's from Chris Hardwick, the Nerdist, who I have since come to love for other reasons. As for other celebrations, I don't know. 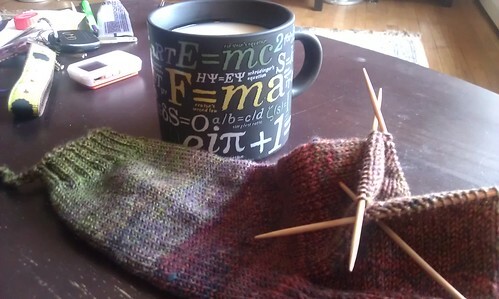 I was thinking of taking myself out to see Life of Pi this afternoon, but I may start knitting a pi shawl instead. So Jillian Moreno wrote a great column about knitting handspun yarn in the new Knitty, and people at knit night last night were talking about it. You should read it, but essentially she knit commercially spun and handdyed yarn and handspun fiber dyed in the same colorway by the same dyer, and there are swatches, oh so many swatches. Of course, I've been (much more slowly) doing the same sort of experiment. 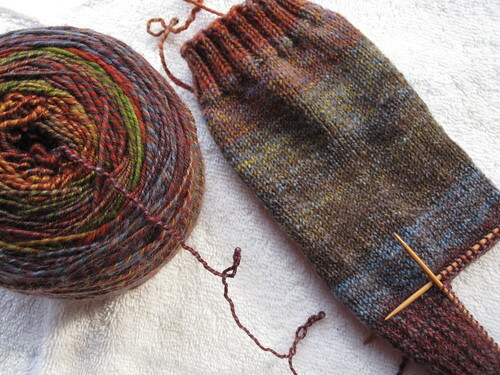 In 2010 I knit a pair of socks in Socks That Rock mediumweight, in one of my favorite patterns. The yarn is a softly-spun three-ply with a lot of plying twist for bounciness and density. Here's a ravelry link to my project, but pictures are below The start of the socks with the ball of yarn. Finished socks, which long held court as my favorite pair, but have now been worn through and patched enough times that they have been retired. (I think I darned the heels at least four times before deciding there wasn't enough there to darn anymore.) Sometime in their long and glorious reign, I ordered a sheep-to-shoe kit from Blue Moon in the same colorway (Jabberwocky). I spun the fiber (slowly, I don't spin fast) long-draw from the fold, and three-plied it with a lot of plying twist. This was one of the methods discussed and sampled in a Spinning Sock Yarn class I took with Abby Franquemont at the Trading Post (in 2010). 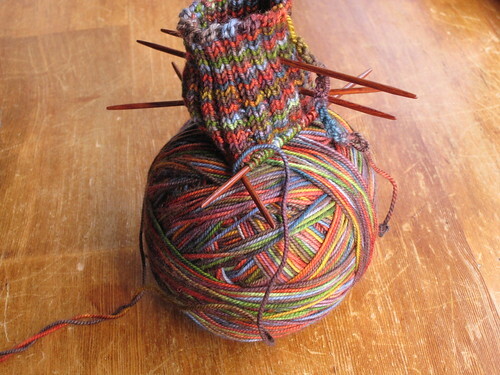 I cast on this past summer, but socks haven't been a thing as much lately, so they've been moving slowly. 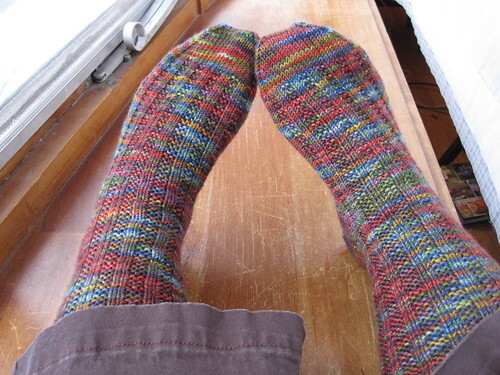 So these are a handspun equivalent pair of socks - except for the missing garter rib, but no big. They're going to be fantastic, but they're not really at all like the millspun ones, are they? The above is an older picture, I'm halfway through the second sock by now and hope to knock the pair out by the end of my impending Spring Break. Ok, so. I know I have posted exactly once so far this year. I'm not going to apologize, I haven't had much to say. But I need to talk about Stringtopia. Last year I went, and by my own report, "The whole experience was an amazing pile of information and sensory overload," and yes, that happened again. But this time was different. This time was better. I've owned my wheel for about 3 1/2 years. 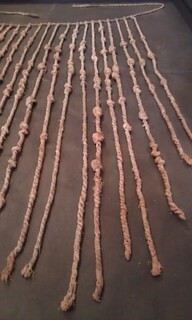 I spindle-spun a very little bit before then, and much more since. I love spinning classes for the way they remind me that learning new things is hard. I love wool, and handspun yarn from crazy-colored tops and batts. I've learned enough that I really think I can make any kind of yarn I want to. But I was starting to think I didn't really like the act of spinning. I couldn't get any momentum with my projects, and I liked my wheel but didn't love it, and I'd tried other wheels but I didn't love them either. Any spinning I did, I did when I could be cajoled into going to our local spinning meetings. I tried starting new projects a few times, but I'd lose interest in the first few minutes. I was starting to give away fiber that I knew I'd never spin, or things that I didn't care what kind of yarn they grew up into. It was not happy for me, and I couldn't figure why. I'd tried to participate in challenges like Tour de Fleece, but I'd get a day or two in and lose motivation. So I signed up for two days of classes. I gave myself a day in the middle to get some things done for work, to relax and rest and try to not come back to work during finals week entirely used up (it only sort of worked). Friday night there was the Bash, where door prizes were handed out and everything changed. 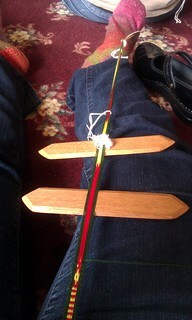 I won a spindle. A Bosworth Mini, in Birds-Eye Maple. I had heard about Bosworths, and yes, whatever they say is true. My new spindle is Really Good. I started spinning right then and didn't stop until I got home Sunday night. There were breaks for sleeping, eating, and my classes, but as Mandie noted a couple times during the weekend, I was spinning in bed before I slept and when I woke up. Saturday afternoon I was grading papers and pulled out a batt that I had thrown in my bag kind of randomly while packing, and I used spinning to entice myself through a stack of tests. I had that batt entirely spun about 36 hours later. I apparently like spinning again. Mandie, being the good friend that she is, started bugging me right away to try wheels, quick, while I liked spinning and there were all these wheels right there. I tried the few that were there for sale, and they were fine, but still, didn't love them enough to make the switch from my perfectly usable wheel. And then I took Beth's class Sunday morning. I'll talk more about the other classes later, but in the morning Drafting Methods class I said I felt like I could do all the things, but I didn't feel comfortable spinning a lot, so that's what I was after. And so. I was doing short forward draw, and troubleshooting my sore pinchy finger and Beth tried my wheel. And said that she always raised the treadles when she sold that one. And holy cow, that was it. I'd thought for a while that part of the problem was the treadle angle, but it never occurred to me that that was something I could change. Beth travels with a toolkit, so at the end of class I borrowed a screwdriver. I raised the treadles about 3/4 of an inch along the plastic thing that attaches to the footmen, and all of a sudden my wheel felt completely different and just the way I wanted it to. It was amazing. I cried. The afternoon class was great, and I loved the feel of my "new" wheel. I'm home now, and it's still awesome. 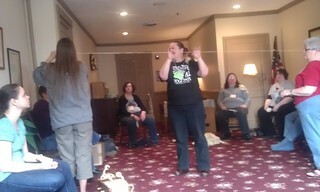 As always, of course, it was amazing being among the yarn people. This year I was far more relaxed, and it was good to see folks from last year, as well as meeting new people. I'll talk more about what happened with the rest of the weekend later, but today, I wanted to post about how Stringtopia changed the way I feel about spinning. Which, for me, glazed the weekend with unexpected joy. There was a joke a week or so ago on How I Met Your Mother where Ted said a girl he dated said "her favorite band is Glee." Yeah, that's me. It's not a new phenomenon though - in high school my cds were all movie soundtracks. My first cassette, once my seven-year-old-self could choose my own stuff, was The Monkees (I was so sad to hear of Davy Jones's death today). Music was always something that came along with something else I liked, not anything I sought out for its own sake. I was out walk/running this afternoon because it was warm and clear and my first 5k of the year is in a week and a half, and it occurred to me that I've been listening to the same running playlist for over a year. My workout playlist of choice is called "January Treadmill" and it dates back to January 2011. So that's thirteen months so far, and I don't see it getting old. I made monthly playlists when I thought to when I was setting out on my 500 mile challenge, but I made one after this one and it wasn't near as good, so I quit. I have thought of sharing it before, but, given my non-taste in music, I didn't figure anyone would care. Also, there's quite a lot of Glee. But seriously, THIRTEEN MONTHS of this and I still love it. I put it together to last about the time I would spend walking my 2.5 mile route, but last weekend I finished that route with 3 songs left. Go me. Maybe I’ll meet someone and make him mine (or not, I like the one I've got). Either way, I'll be fine and dandy, and I hope you are too. Happy new year. I got up this morning and saw it was snowing, so I went for a run/walk, because I like my neighborhood route and it's no fun when it's icy and slushy, so I needed to do that a few more times before the snow makes me have a few months without. I pay attention to my pace and time and distance, because I have to improve all of that to participate in the half marathon I already signed up for next fall. I really don't recognize myself in any of those things, but somehow they're a part of who I am and what I'm up to lately. This all started with the 500 mile challenge, which ended in May with about 440 miles done. A year and a half after goading myself off of my sofa with that crazy goal, I get cranky if I don't get some exercise every few days. Which means I've got a habit of exercise, which was really the goal of the 500 mile project. And so now I'll try and get a spreadsheet going for next year, because 500 miles in 2012 sounds entirely doable. The best part of this is the friends who have come along with me. Mandie, Jill and Bri have their own goals, but have been awesome cheerleaders and pacers for me this fall and all the way through. I'm enjoying learning to run with them and I'm excited to see what we do in the future.